A professional email address that uses your domain name is key to building trust with a small business. In an era where consumers are increasingly wary of scams, businesses need to use professional email addresses, such as james@williamslaw.com, to provide a sense of professionalism and credibility in your business. When you’re ready to create your email address, our free business email address guide will show you how to get set up if you already have a website. If you need a place to host your website, Bluehost offers a business email and small business website hosting for as little as $2.95/month. To leave the best impression with your email address, the first thing you need to do is buy your own domain. In other words, use JDoe@YourBusiness.com instead of JDoe@Yahoo.com or JDoe@Gmail.com. Years ago, a custom domain was a mark of professionalism. It showed experience and dedication that you chose to buy a domain for your email address (and presumably, created a website, too). Today, however, it’s more of an expectation. Custom domains are cheaper than ever, and it takes just 15 minutes to create an email address with one (just see our guide on how to get free business email). Using the tool below, you can search for available domain names. 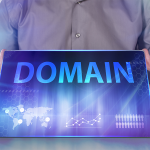 For help brainstorming, check out our 25 domain name tips from the pros. We recommend purchasing your domain through Bluehost, since you can create up to five email accounts with a website hosting plan for just $2.95/month. GoDaddy is a little cheaper for domains (around $12/year), but you’ll have to pay an additional $4.99/month for each email account. Click here to check out Bluehost’s hosting plans. Though avoiding unprofessionalism is often the biggest reason to purchase a custom domain, there are a few others to keep in mind. These reasons include having a more memorable email address and not being tied down to an internet service provider (ISP). On a practical level, custom domains allow you to create simpler and cleaner email usernames. With a generic provider like Gmail, you probably won’t be so fortunate to find JDoe@Gmail.com available. Instead, you’ll have to opt for something like JDoe4855@Gmail.com, which isn’t nearly as memorable. With your own domain, you literally get first dibs on whatever name you want. A custom domain email address will be easier to communicate, whether you’re shouting it across the room or printing it on business cards. It will also be easier for customers to remember and associate with your business. If you use a business email address that’s tied to your internet service provider (ISP), you should replace it immediately. With an email like @comcast.net or @verizon.net, you make yourself dependent on the continued use of that internet provider. Should you cancel your Comcast internet, your email address goes away with it, along with all marketing efforts you used to promote that address. Besides your domain, the other key component to your email address is your username. It’s the JohnDoe part of JohnDoe@YourDomain.com. It goes without saying that a simple username like JohnDoe is going to look more professional than CoolDude477 or MrDoe12. The question remains, however, whether you want to use your full name, first name only, a combination of name and initials, or a different username entirely. You also need to make sure your display name on emails is set up correctly. This is the simplest and most popular professional email address format. Displaying just your first name is often the easiest to remember, leaves a personal connection with clients, and allows you to maintain privacy should you not want to disclose your last name. The downside is you’ll need to break the format if two or more employees have the same first name. This has many of the same perks as the first option, but allows for more combinations should two employees have the same first name. Again, employees maintain some privacy, which can be helpful for support agents who speak with the occasional disgruntled customer. This is actually the second most popular format after first name only email addresses. It follows the logic that clients tend to remember last names over first names. You’re far less likely to have any duplicate usernames compared to the first two options, and it’s also more succinct than the next option of displaying full first and last names. Don’t expect to hide your identity with this format, however. This is popular for executives, professionals, and sole proprietors like real estate agents who consider their full name a brand. While you can always display your full name next to your email address, regardless of the format you choose (as we’ll explain next), this can still help to make your address more memorable. Generic usernames are useful to display on your website. They give visitors special email addresses to contact for support, sales, press, and other general needs and questions. They look professional, and they keep your business better organized. As we’ll describe below, you can set up these email addresses to forward to another account. All of these examples assume that you already own a customized domain with an email address attached. If your web hosting service doesn’t currently offer this option, consider switching to Bluehost and get both a custom domain and email address for just $2.95/month. Your email address is only half the picture. When you create a professional email address, you can also choose a display name that appears next to it on your messages. For the most part, this will be your first and last name. The simplest approach is to display your full name next to your email address. This is typically what you want to do unless you’re using the email address for an automated mailing campaign, cold emails, or support emails. This approach is good if visitors aren’t familiar with you personally, but are familiar with your company. Use this display name format if you’re cold emailing, responding to visitors who submitted a form, or sending support emails. Many businesses display their company name when sending promotional emails, like a newsletter campaign. A visitor who joins a mailing list will recognize your company name, but probably not any employees at your business. When you create special or general purpose emails to use on your website, it’s important to use email forwarding to send these general emails to the correct people. For example, using contact@yourbusiness.com that forwards to your customer service team looks more professional than using a personal email address on your “Contact” page. If you don’t have a website yet, read our guide on how to create one and get a free business email address when you get web hosting for $2.95 per month. A generic address, like Info@YourDomain.com, looks more professional, and allows you to hide your main email address. It’s also typically more useful, since you can forward emails to multiple accounts. For example, an email sent to Sales@YourDomain.com can be forwarded to your sales managers. An email sent to Press@YourDomain.com can be forwarded to you and your social media manager, and so on. Most business email providers will make it easy to set this up. You can create “Group” emails that forward to multiple accounts, or create email forwarding rules. With Bluehost, for example, there’s a special menu called “Forwarding” where you can create a generic email (like Info@YourDomain.com) and forward it to one or more personal email addresses. 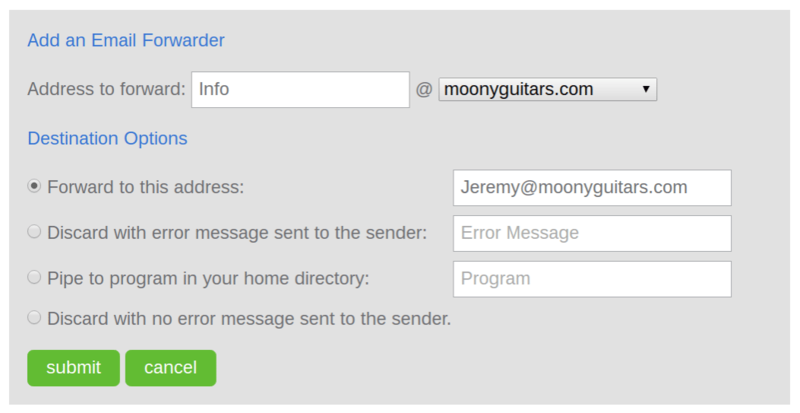 In the example above, Info@moonyguitars.com is being forwarded to my personal address of Jeremy@moonyguitars.com. If I wanted it to forward to additional employees, like my general manager, I would simply click “submit” and then “Add email forwarder” to set it up again. It’s important to use a professional email address for your business email because it gives more credibility to your business and makes your business appear more legitimate in the eyes of your potential customers. A professional email address also gives your business name more exposure because professional email addresses include your own domain name, and the professional appearance can help increase sales by instilling a sense of trustworthiness. Professional First Impressions – A professional email address gives your business a professional appearance, making others take your business more seriously. Consistent Branding – Being consistent with your branding is key and email is part of that. Every employee should have a business email address following a cohesive company-wide format, such as firstname@yourURL.com. Gain Trust – By presenting your business professionally, you are giving people more confidence to trust in your business. In return, this can help drive more sales. Increases Brand Awareness – Since your professional email address uses your business’ domain name, every time an email is sent, it displays your domain name—often your business name—helping to spread brand awareness. Cohesiveness – Standardizing email addresses for one company creates a cohesiveness and makes it easier to manage employee emails, as they all should follow the same format. Control – Centralizing email addresses helps give businesses more control over user email accounts as they are managed in one main hub, such as G Suite for Gmail-based business email accounts. There are a few things to avoid when creating a professional address to ensure your email address doesn’t look unprofessional. For example, using nicknames or formats that cut off employee names can undermine the professionalism of your professional email address, so be sure to avoid these types of things. Avoid Long Email Address Formats – Using email address format such as first.last@URL.com is OK for employees with names like John Roy. However, long names such as Elizabeth Whitehouse would make for a very long email address, so avoid formats that could end up lengthy. Don’t Use Numbers – If you choose an email format such as firstname@URL.com, you may run into common first names. However, instead of using numbers to differentiate them, try a new email format such as first initial and last name instead. Don’t Use Nicknames – Shortening Christopher to Chris is OK, but avoid nicknames that aren’t relevant or too personal, as it can look less professional. There are a number of professional email address service providers to choose from. We’ve narrowed it down to our top five for small businesses to help make it easy for you. Most plans cost under $5 per month, making them affordable, and all options allow you to connect your custom domain name. Bluehost – Free with hosting plans starting at $2.95 per month. Zoho – Standard email plans starting at $3 per month. Gmail – Professional email addresses for $4.95 per month with annual billing plan. Office 365 – Microsoft Office Suite and business email in one. Rackspace – Low cost email plan for $2 per month. Learn more about the different email service providers, including what features they offer, storage, security, customer service, and more in our article on the 6 best email providers. A professional email address speaks for your business by leaving the impression of a skilled and established business. Every business should use professional email addresses to present your business in a professional light and to help gain the trust of those you are doing business with. A professional email addresses is the first step to prove you’re a legitimate company. 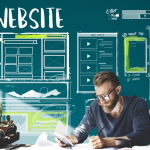 However, as domains have become cheap and websites ubiquitous, also be sure to have a professional website to back your professional email address. When you’re ready to get started, be sure to check out Bluehost, where you can get email, web hosting for your professional website, and a domain for only $2.95 a month. Click below to get started. I just created a gmail acc. a few months ago but dew to my phone being stolen,I remain doing nothing for about a month but when I borrowed a phone to use,I could remember the user name but not the password.In that way I was not granted access to my gmail acc. Is there any way we can find out my password? This sounds simple enough for me! Thank you so much for sharing your expertise! Thanks for the pro guide. Now I am clear to choose best Email foe my blog.